Tuesday’s opening night featured prep school action in the National Division. A large contingent of national/regional media and scouts have already shown up so far including Frank Burlison (BurlisonOnBasketball.com/McDonald’s All-American Game voter), Van Coleman (The Basketball Channel/McDonald’s All-American Game voter), Ronnie Flores (BallisLife.com & GrassrootsHoops.net), Josh Gershon & Travis Branham (Scouthoops.com), Eric Bossi (RivalsHoops.com), Jonathan Givoney & Mike Schmitz (ESPN/Draft Express), Dinos Trigonis (Fullcourt Press & Nothing But Net), Christian Popoola (PremierBall.com), Etop Udo-Ema (Fullcourt Press & Dunk News), Alex Carmon (BeachCityHoops.com) and Johnny Hines (Courtside Films). Colleges that passed through on opening day included Texas A&M, Utah, Colorado, Arizona State, Ole Miss, TCU, UNLV, Wyoming, Utah State, St. Mary’s Hawaii, Cal State Fullerton, Tulane, Furman, Portland, Pacific, Southern Utah, Sacramento State, Idaho, Winthrop and Midland JC. Terry Armstrong, 6’6” 2019 Bella Vista Prep (Scottsdale AZ): Athletic pogo-stick is a Michigan native with great downhill speed to the hoop. Armstrong slices through defenses like a Cuisinart cuts through fruits and vegetables. 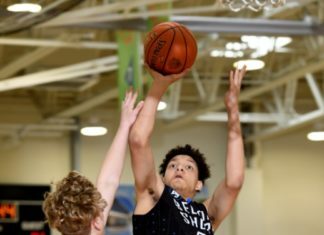 Arizona signee led BV with 15 points as his squad downed NBA Academy Blue 77-40 and then followed up with a 31 point outburst in 2nd game of the day versus Nationwide Academy (OK). Iverson Molinar, 6’3” 2019 Veritas Prep (Santa Fe Springs CA): Strong and athletic wing guard was playing with an injured hand but it did not stop him from scoring 30 points in Veritas’ 89-56 win over Strength N’ Motion (TX). 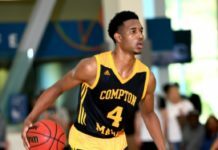 Mississippi State signee is a good get for Bulldog head coach Ben Howland. 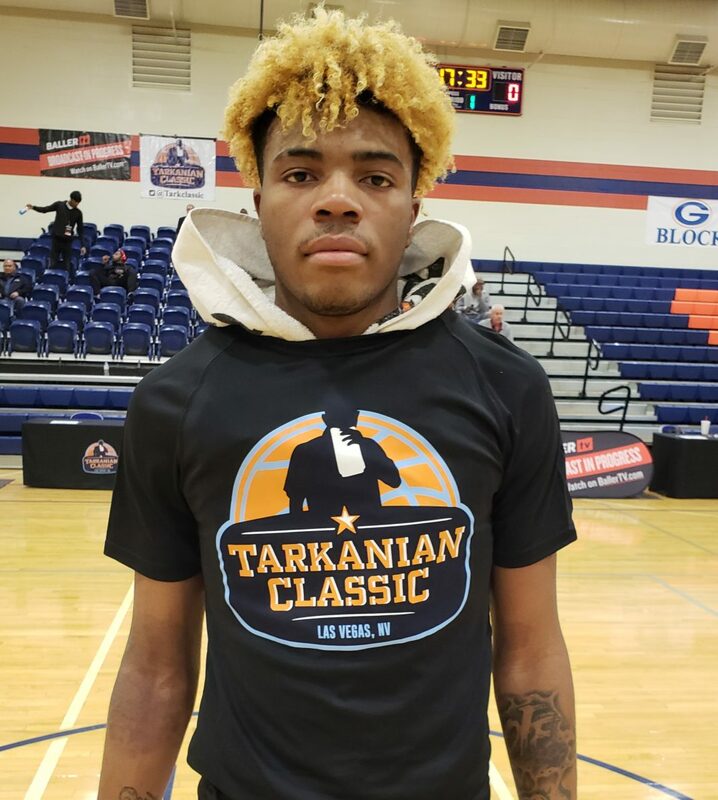 Emanuel Miller, 6’7” 2019 Golden State Prep (Napa CA): Virginia Tech-bound swingman attacks the rim with both bounce and authority. 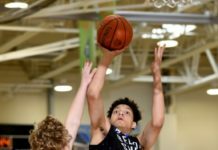 Had 19 points (3 threes) in GSP’s win over Elite Prep White/CA. Sadraque Nganga, 6’9” 2022 Compass Prep (Phoenix AZ): Very promising young forward from Angola with nice length to go along with impressive ballhandling and scoring skills. High-major name for the future! 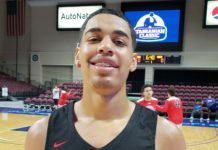 Ismael Cruz, 6’3” 2019 Veritas Prep (Santa Fe Springs CA): Burly off-guard has a soft and accurate perimeter stroke as was evident by his 23 points (6/10 3FG) in his team’s win over Strength N’ Motion (TX). Carl Lewis, 6’10” 2019 Hillcrest Prep (Phoenix AZ): Extremely physical post player is a load to deal with in the paint. Addison Patterson, 6’7” 2020 Bella Vista Prep (Scottsdale AZ): Big guard has versatile perimeter skills and is deceptively athletic. Canadian import had 13 points in big 77-40 win over NBA Academy Blue. Nick Blake, 6’4” 2020 Middlebrooks Academy (Los Angeles CA): Explosive wing can put points on the boardand is an underrated passer too. Rick Issanza, 7’0” 2019 Bella Vista Prep (Scottsdale AZ): Extremely long and athletic rim-protector continues to improve at a reasonable rate. Rick had a solid 13 points and 9 rebs today in win over NBA Global Academy Blue. Oscar Lopez, 6’4” 2019 Hillcrest Prep (Phoenix AZ): DePaul signee is savvy wing player that can finish above the rim as well as through contact. Orlando Robinson, 6’8” 2019 Middlebrooks Academy (Los Angeles CA): Fresno State signee is a productive PF that plays with energy and can score effectively around the basket. 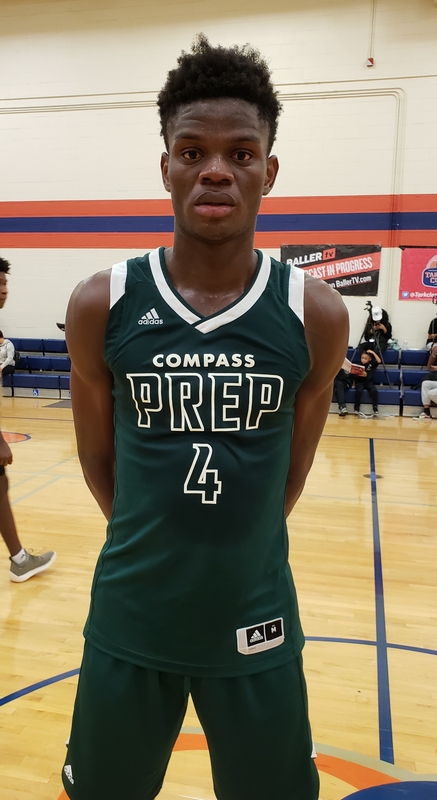 Fallou Cisse, 6’8” 2021 Compass Prep (Phoenix AZ): Agile forward runs floor well and competes with passion on the glass. Very nice upside! Brian Washington, 6’7” 2019 Nationwide Academy (OK): Strong and springy PF is active around the cup. Las Vegas NV native is a good rebounder. Hunter Woods, 6’6” 2019 Golden State Prep (Napa CA): Former Muir (Pasadena CA) star is spending a post-grad year at Golden State Prep. Woods’ perimeter shot looked good here today. 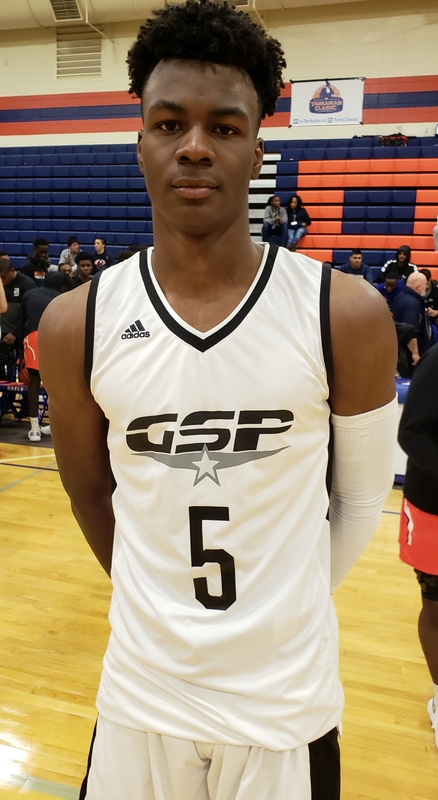 Timothy Ighoefe, 6’11” 2019 NBA Global Academy Blue: Nigerian big man with chiseled physique is still raw in many ways but does have nice long-term potential.